I think that bronze statue restoration is not only involved with the statue itself but with reviving memory of the customer together. Restoration is not necessary if nothing happens. Important is that I restore the statue which has lost attraction due to stain or damage and that I can find the customer is happy with it looking at it for a long time. Difficult point in restoration is "to reproduce the image stored in the head of customers". Customers may request to get the same color at purchase but in rare case there is a picture of the original color left. Therefore color compounding must be made on the basis of the memory of customers. Mere reproduction is not sufficient. Nothing is more important than getting the level one step higher than the image that customers have for the finish. Even though I am satisfied with the color of finish, customers may say that the finish is different from what they have if the finish level is higher by two or three steps than what they have drawn. Statues must be revived through integration of the memory of customers and the image of mine for the finish. So far I made gates of high design properties and such objets as to be displayed in the show windows of Ginza, Tokyo utilizing forging technique. Though I didn't exclusively studied fine arts, I could smoothly attain knowledge and experience pertaining to design through forming into reality requirement of customers who have deep knowledge in art. Forging is a manufacturing method involving shaping of metal ingot using localized compressive forces with a hammer or a die. Then, work pieces are bent or machined to form certain figures. Finished parts require surface painting. Finishing technology in forging is made much of for bronze restoration. Finish is very important in forging. Customers are not happy if painting or polishing is insufficient. My skill owes much to previous jobs pertaining to finishing forged products I was engaged in for more than 30 years. Bronze restoration is not so familiar. Consequently many bronze statues are left damaged or with paint stripped by aging. Some may be destroyed in the worst case because many people don't know who can restore even though they want to have them restored. That's why I want to familialize restoration or maintenance of bronze statues to the public. 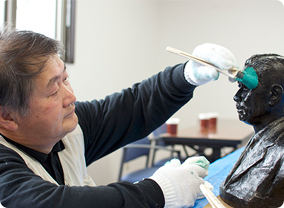 As a matter of course, mastering bronze restoration skill cannot be done in a short time. It takes at least 5 years to offer customers techniques of compounding paint materials and painting in layers. I want to hand down this technology to younger generations. However, the technology would not last long if we don't have more customers good enough for the craftsmen to live on the restoration job. From now on, my mission may include enlightenment of the business area pertaining to bronze restoration in addition to the jobs laying before me. He used to manufacture articles of high design properties such as illumination in bustling streets, objets in show rooms, etc., and now has his own job of bronze restoration and maintenance making good use of his unique forging technology. His art works are seen in nationwide art museums and private houses.